This lovely, gentle walk is on well-made paths and offers the most magnificent views for only a small amount of effort. 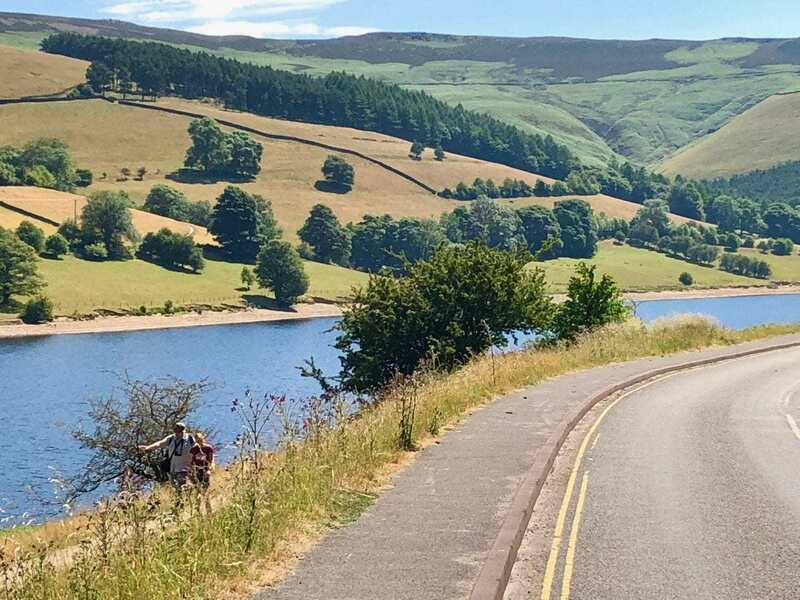 The circular route completes a circuit of one half of Ladybower Reservoir and passes the awe-inspiring Derwent Dam, scene of the practice flights for the famous Dambusters raids during WWII. The accessibility of the route makes it suitable for family-friendly cycling and users of all-terrain wheelchairs or pushchairs, as well as hikers and dog walkers. 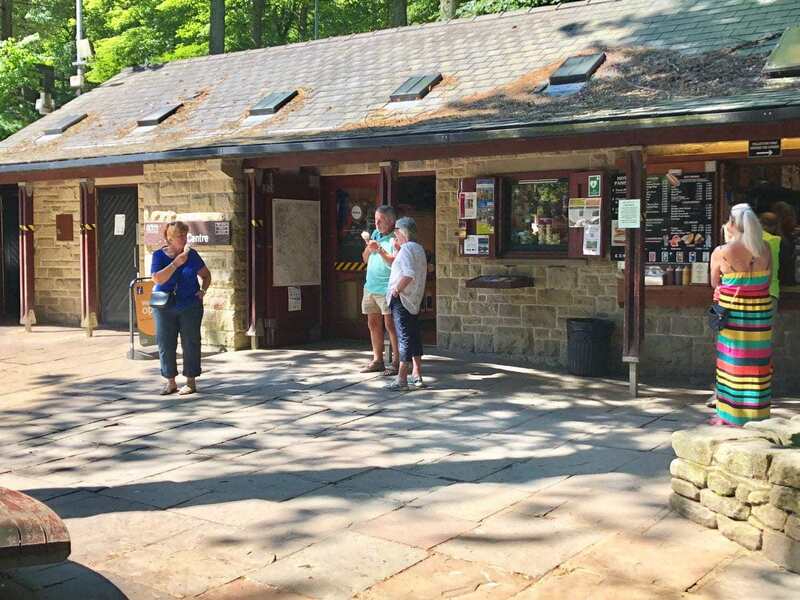 Free parking is available along the route, although the walk starts and ends at Fairholmes Visitor Information Centre, operated by the Peak District National Park. If you choose to park there for a small charge, your money goes towards maintaining the facilities and supporting the charity. There are toilets, a café and a gift shop at the Visitor Information Centre. 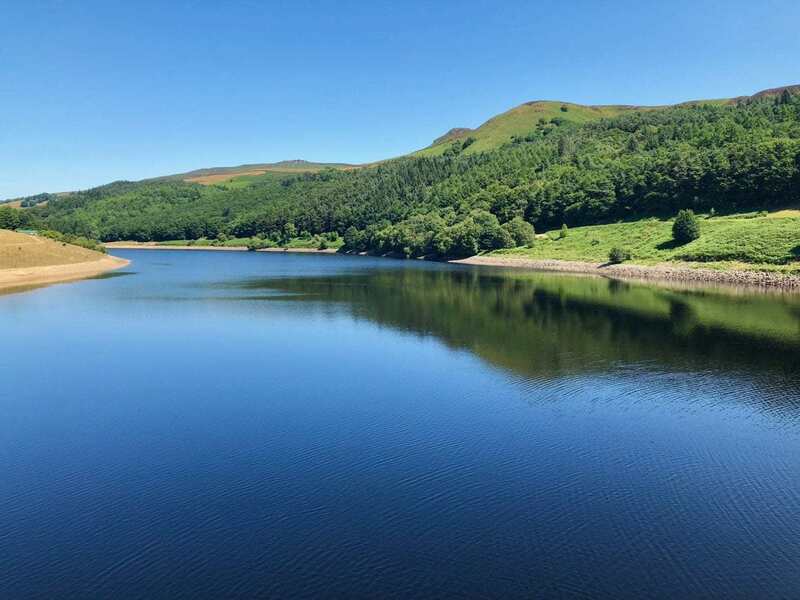 From the A57, follow the brown signs marked ‘Derwent Valley Dams’ and park either at Fairholmes Visitor Information Centre (SK 17247) or in one of the parking areas along the road close by. From the Visitor Information Centre, turn left and walk on the wide pavemet alongside the road that takes you back towards the A57. The road is quiet, the path is well made and level, and the views are spectacular. On your left as you walk, look across the reservoir towards the bulk of Derwent Edge. To your right initially are the wooded heights of Hagg Side and, further on, the gentle green slopes of Crook Hill, managed by the National Trust. The tall ‘peaked’ hill directly ahead of you is Win Hill. 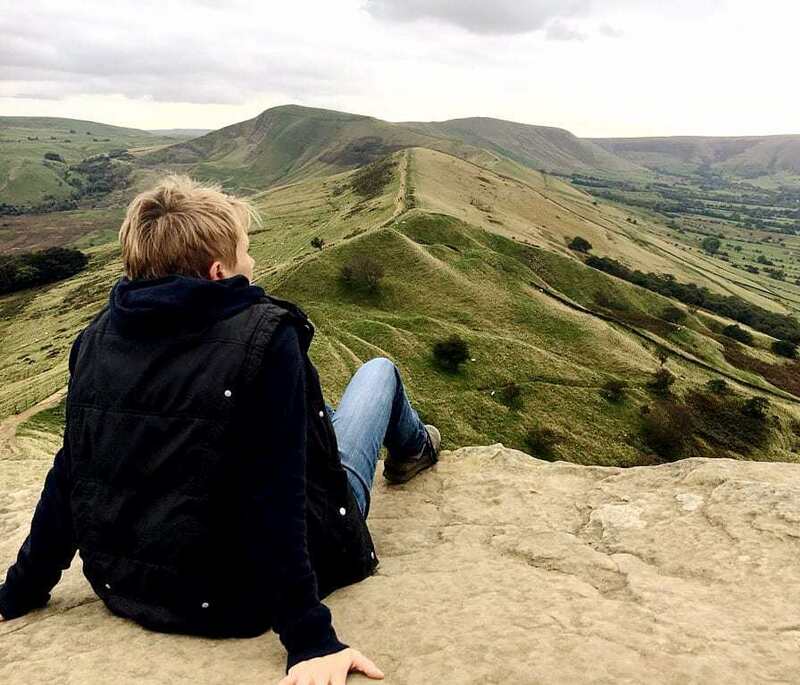 Win Hill towers to a lofty 463m and, for those who like more challenging hikes, offers unsurpassed 360 degree views of the Hope Valley and the Derwent Valley. After approximately 3km, pass through a gate beside a cattle grid. 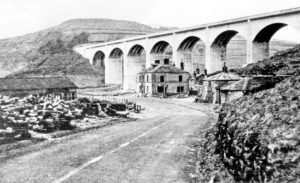 Easily visible ahead of you is the beautiful Ashopton Viaduct, built in the early 1940s. The arches that you see rising above the water are only the very top of this impressive structure, as can be seen from this image taken during its construction (picture credit picturesheffield.com). Once you reach the A57, turn left to cross the bridge, taking time to admire the views as you go over. Immediately after crossing, look out for a track to the left that brings you back to walk on the other side of the reservoir. Although the track is marked Private Road, please note that this is a public footpath. Go through a wide gate and follow the quiet track along the edge of the reservoir, again with marvellous views ahead of you. The track is gently undulating and well maintained, and it passes through beautiful shady woodland. Ignore all footpaths off and stick to the main track. After approximately 3km, you will crest a hill and come upon a small cluster of pretty houses. 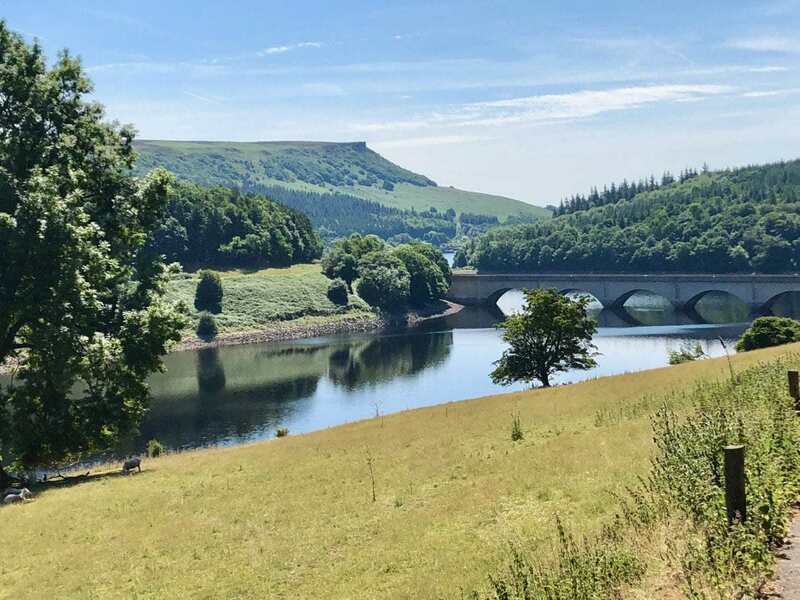 These houses are all that remain of the village of Derwent, which is one of the two villages (Ashopton being the other) flooded to create Ladybower Reservoir. The villages of Derwent and Ashopton were small but thriving communities in their time, with a number of houses, a shop, a church and a coaching inn. The villagers were all relocated and the buildings submerged under the waters. In particularly dry summers, look out for the exposed foundations of some of the village buildings. Soon after passing through the village the track forks, with the right hand spur signposted as a Public Bridleway to Langsett. Continue on the left hand track, heading slightly downhill. Directly ahead of you is the mighty structure of Derwent Dam. In the winter months there is often a torrent of water cascading down its face, spilling over from Derwent Reservoir above. The building of the dam was started in 1902 and it stands at an impressive 35m high. Derwent Dam, and the similar Howden Dam at the top of Derwent Reservoir, are well known for being the site of the practice bombing missions for 617 Squadron (known as the Dambusters) before their attack on the Ruhr dams in Germany in 1943. 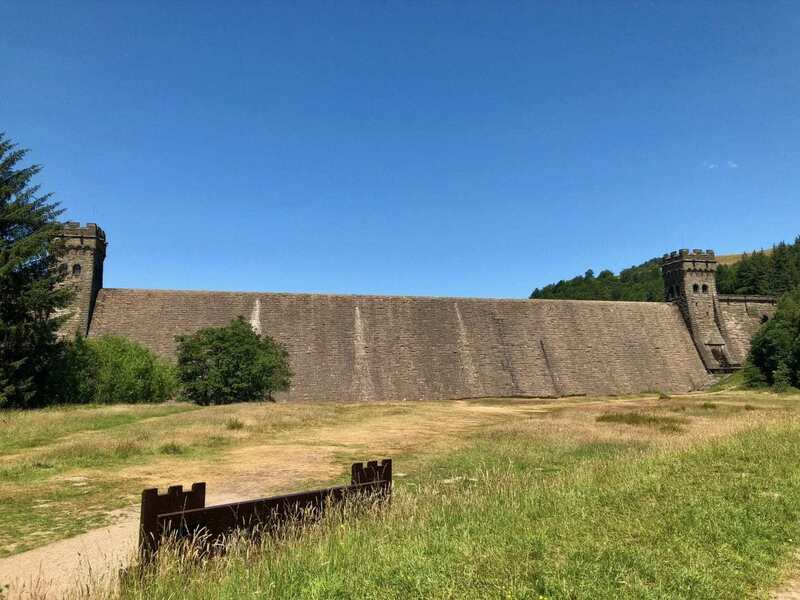 The 1954 film ‘The Dambusters’ was filmed here and the reservoirs see regular flypasts from the Lancaster and Spitfire bombers of the Battle of Britain Memorial Flight. Continue on the track for approximately 500 metres, before arriving back at your start point of Fairholmes Visitor Information Centre on your left. 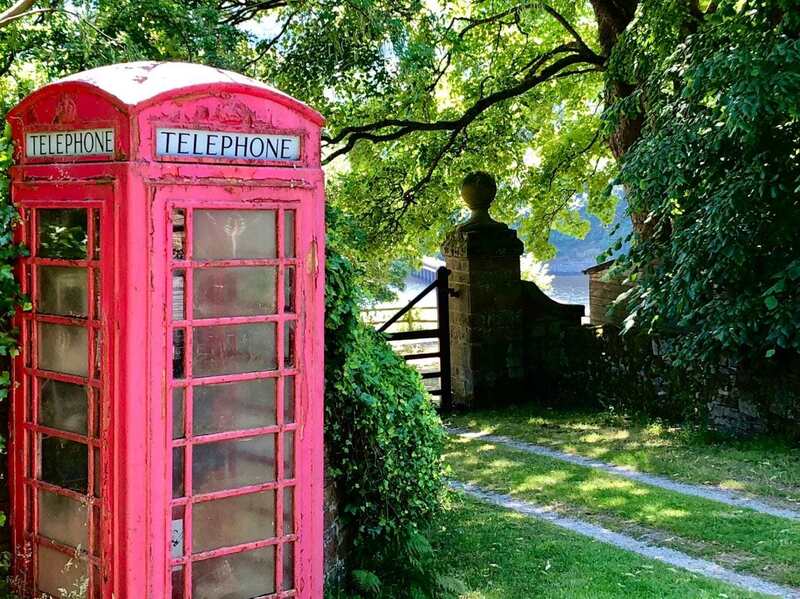 This walk is also suitable as a short bike ride with a cycle hire station at Fairholmes.